A millennium graduation thrust Sara into the medical profession without any clear forward plan. The medical school year book provided some inspiration placing her in the Emergency Medicine section and suggesting she was the person most likely to sail the seven seas. 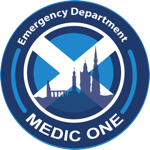 Her first SHO job in the Emergency Department of the Royal Infirmary of Edinburgh was so exciting and rewarding that it pushed aside any doubts about where her career was headed. The career did however have to go on standby whilst she circumnavigated the globe (4 seas, 3 oceans, 2 years….bliss). Having (finally) completed training and achieved Consultant status in 2012 Sara can now been found promoting a career in Emergency Medicine to anyone who will listen. She shares her passion for emergency care by regularly instructing on ATLS and EPLS courses. Current responsibilities include the junior doctor rota and locum appointments. She is well qualified to discuss flexible and less than full time training patterns, having done both over the course of her training. She welcomes enquiries from anyone who wishes to become part of the energetic and dynamic team that convinced her that Emergency Medicine is great medicine.